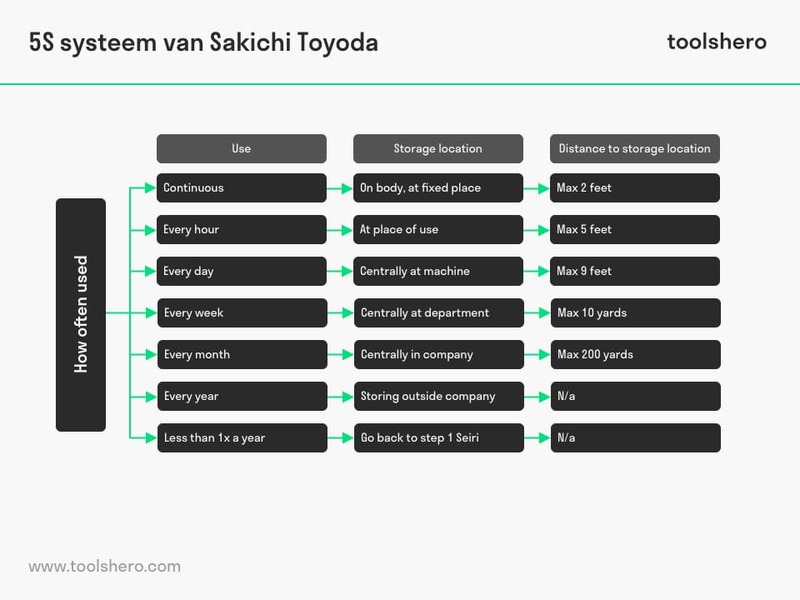 This article explains the 5S System, developed by Sakichi Toyoda, in a practical way. After reading you will understand the basics of this powerful quality management tool. The history of 5S System seems to go back as far as the 16th Century and Venice shipbuilders. In an effort to streamline the assembly process, workers used quality process production to build ships in hours instead of days or weeks. In the 1970s it was Sakichi Toyoda who developed the 5S System within the broader Total Production System (TPS). Over the years the 5S System has spread and can be found within Total Productive Maintenance (TPM), the visual workplace, the Just-In-Time (JIT) process, and LEAN Manufacturing. Basically all with the same aim: improving processes to better improve production. The 5S System is not complex and straightforward to implement. However, every execution needs a proper plan. At the end of this article some tips & tricks. A clean work environment motivates, is safer and makes efficiency increase cleaning and maintaining is more than dusting and hovering. It’s not only the outside of the machine! Embed the cleaning routines in the standard daily work of the employee. Select an area (sub area) and assign people to area/sub-area. Set a cleaning scheme expressing clearly: what to clean, the desired result (norm, use pictures! ), method (sponge, scraper, detergent), interval, time needed and who. Make sure to have participation of all levels and disciplines (incl. managers, team leads and engineers), even office personnel to create more leverage. Emphasise that the cleaning is clean to inspect. Look for sources of contamination. This way we identify the room for improvement which could ultimately lead to less cleaning. Standardize the best practices in the work area. Standards are needed so all work in the same fashion. Make your standards visible. By doing so they are better controllable and easier to maintain. Maintain high standards of housekeeping and workplace organization at all times. Stimulate all to maintain the high standards. Role modelling is the key aspect here. Managers, team leads, supervisors will make the difference in this phase! Set up training for new employees. Perform regular audits and hand over improvement feedback to the team of the audited area. Over time standards will change. Could be due to new machines, new procedures, safety rules or simply due to the fact that the overall area improved. Adjust the 5S standards together with all involved. Remember that the 5S responsibility and competence over time has sunk in to the lowest level of your organisation. If they walk the talk together with the higher ranks you have built a solid foundation for future success. The 5S Initiative is not a Stand Alone Effort. The 5S System practices should be part of the performance improvement plan and operational excellence strategies. Don’t form a 5S specific team. 5s needs to become the standard for all. The power of visual management is evident. Assure to have taken pictures prior to the start of a 5S System. Do make picture afterwards (from – to pictures). And above all MAKE IT FUN! Managers sometimes tend to forget that people perform best when fuelled within a fun, not hostile environment. Changes which are fun are mostly easier adopted into the daily routine. What do you think? Can you apply the 5S system in today’s business companies? And if so, how do you use it and what are your general results and learning lessons? Are the basics the same or are there additional success factors? Gapp, R., Fisher, R., & Kobayashi, K. (2008). Implementing 5S within a Japanese context: an integrated management system. Management Decision, 46(4), 565-579. Liker, J., & Convis, G. L. (2011). The Toyota way to lean leadership: Achieving and sustaining excellence through leadership development. McGraw Hill Professional. Lorriman, A. (2017). 5S In The Workplace. Retrieved from: https://www.isolocity.com/5s-in-the-workplace/. Ortiz, C. A. (2015). The 5S Playbook: A Step-by-Step Guideline for the Lean Practitioner (The LEAN Playbook Series). Productivity Press; Spi edition. 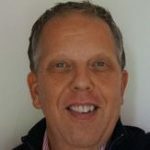 Paul De Weerd is an Operational Excellence Team Lead with a broad management experience in operations including the field of supply chain management, manufacturing operations and Lean implementations.